Just recently an NBA Live 19 teams update went into effect to reflect the big trade involving the Dallas Mavericks and New York Knicks. The two teams swapped several major players in a deal to improve their respective clubs for the future. 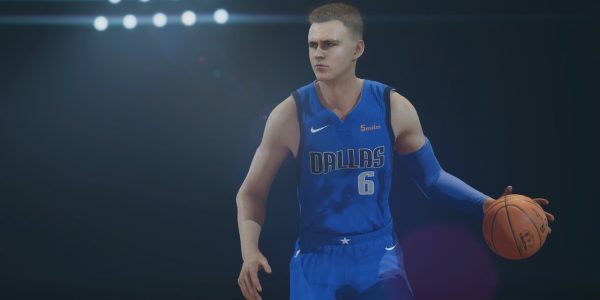 NBA Live 19 will now let gamers see how the teams fare with their new players as Kristaps Porzingis joins the Dallas Mavericks and DeAndre Jordan is among those on the NY Knicks. One of the biggest stars to change teams in the trade is Kristaps Porzingis. Also dubbed “The Unicorn,” the European player has been a member of the New York Knicks since the 2015 NBA Draft. Unfortunately, he’s been sidelined for the past season or so, despite having All-Star abilities. EA Sports’ NBA Live 19 game Twitter account showed him off in his brand new jersey. He’ll now join a Dallas Mavs team that also features promising European rookie Luka Doncic, as seen in the screenshots above. Still, Porzingis is going to be on the sidelines for the rest of this season. That’s the real NBA, though, as gamers will be able to test out the Doncic to Porizingis connection in the NBA Live 19 game as the season goes on. On the other side of the deal, the New York Knicks acquired All-Star big man DeAndre Jordan. He’s been a member of the Los Angeles Clippers and Dallas Mavs during his career. The NBA Live 19 game posted the following screenshot on Twitter of Jordan in his new team jersey. Jordan should actually be on the court this season for a Knicks team that made this deal for the future. New York also picked up a guy they could have drafted a year ago, as they’ve added Dennis Smith Jr. with the trade. Ironically, Smith was just on the inactive list in the game due to trade rumors. Now he’s really been traded. Most analysts believe this deal was arranged so the Knicks can ultimately add a major NBA free agent or two. The expectations are they’d go for Kevin Durant along with Kemba Walker or Kyrie Irving. Time will tell if the Knicks add these free agents this summer. For now, gamers will be trying out the players on their new teams to see how they fare. It should be interesting to see if either team can gain entry to the postseason after the trade. Can Smith Jr. and Jordan help this NY team improve to playoff-worthy? In conjunction with the trade and player relocations, NBA Live tweeted about their newest live events in the game. Gamers will be able to score virtual jerseys for Porzingis and Jordan, among other items, with the latest promotion. Get more of the latest game information, news, and how-to help at our NBA Live page.